When I Left Home, co-written with David Ritz, begins with Guy in Louisiana where his earliest experience with guitar playing was through tin cans and screen wire as a youngster. After moving to the Windy City, Guy met Muddy Waters and became a session player at the legendary Chess Studios. He also describes in the book about meeting and working with other greats such as B.B. King, Howlin’ Wolf, and the Rolling Stones, as well as his partnership with harmonica player Junior Wells. 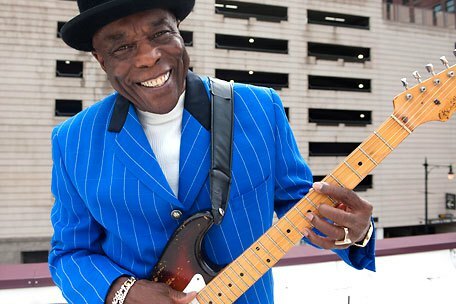 A Rock and Roll Hall of Fame inductee, Guy, 75, spoke to Spinner to talk about aspects of his extraordinary life that includes overcoming his initial shyness at performing, living without food, meeting Muddy Waters and performing with Stevie Ray Vaughan on the night he died. In the book, you wrote that your first encounter with music was hearing the birds sing. Did you want to become a musician growing up? In the early days, you were once a shy performer in Louisiana. And I turned my back to the audience. [Big Poppa] said, “If you don’t turn around, I can’t use you.” I’d have to go back pumping gas. But a good friend of mine heard about it. He said, “Man, I got something to make you turn around and face that crowd. ” He came up with a bottle of Dr. Tichenor antiseptic and a Coca-Cola and put [Thunderbird] wine in there. I swallowed it and some of it got me high and I turned around. I’ve been turning around ever since. After you moved to Chicago in the late ’50s , you experienced a rough period during which you were broke and hungry. And then you met a man who brought you to the 708 Club, and afterwards you met Muddy Waters for the first time. I was walking down the street with my guitar. I wasn’t going to sell my guitar — I guess I would have died from hunger. A guy saw me and asked me could I play, and I said, “Yeah.” I went over to his house. I didn’t know who the hell he was and I still don’t. I did a Jimmy Reed song. He told his wife, “Baby, get ready. We ought to go for a walk.” I didn’t know what he was thinking. When you were on Chess Records, owner Leonard Chess inhibited you in some way because he thought your guitar playing was too wild? I had the amplifier turned up with the feedback like all the British guys did. They were like, This is what we want, after they found out that I was playing it. Every time I see [Jeff Beck] and Eric, they remind me that when I first went to England in 1965 — they had never saw anybody play blues on a Strat. They said, “Man, you were the one who made us play Strat.” I don’t know what I was doing. I tell people right now that I was looking for a dime and I found a quarter. Those British rockers kept the American bluesmen’s names alive. They did so much for us. Some people asked me, “Was I ignorant because they became bigger stars than B.B. and me and everybody else?” I said “No,” because they woke America up and let America know who we were. Otherwise, they could’ve went on and said, “Yes, this is something new.” But they didn’t say that. You recorded ‘Hoodoo Man Blues’ with Junior Wells in 1965; it is regarded as one of the definitive blues albums. The guy just called us and said, “Come to the studio.” Matter of fact, we never did rehearse nothing back then anyway. We just go in and say, “Let’s play.” They would bring a big bottle of wine or whiskey and say, “I want you to sound just like you did last night at that blues club because the people were loving it.” Right now, I think we still should maybe go back to something like that because I think we get too tech in the studio. You performed “Sweet Home Chicago” at the Alpine Valley show in 1990 with Eric Clapton, Robert Cray, Jimmie Vaughan and Stevie Ray Vaughan, who was killed in a helicopter crash later that night. Are you going to be working on a new album? I was in New York and my record company called me. I had a good meeting with them and [they] said, “I can’t wait ’til you get back into the studio. You go and do your thing.” So I’m going into the studio somewhere around October and do my next CD.